During the evening of January 23rd 1974, the peace of the Berwyn Mountains was shattered by an incident which has gone down in the annals of Ufology not just in the U.K. but on an international basis. Perhaps typically with these incidents, over 30 years after the incident there are differing opinions of what did happen on that cold winter’s evening on a lonely Welsh mountainside. The Berwyn Mountains - a beautiful area of hills spattered with hill farms an villages. The isolated high moorland can be treacherous in bad weather. It is probably an exaggeration to describe the Berwyns as a mountain range, they certainly are not in the same category as the Rockies or the Himalayas but more like a range of hills spattered with hill farms, villages and the odd caravan (trailer) site. To the east of the Berwyns is Llangollen a picturesque market town in the Dee Valley and to the west is Bala (Lake Bala) a water sports and hill walking centre. The entire area is noted for its scenic beauty and attracts many tourists. However, the Berwyns are very isolated and desolate in places and woe betides the ill-equipped hill walker who ventures out in bad weather. Certainly in 1999 at the beginning of at least one of the narrow roads which traverses the tops there was a (somewhat ancient) sign which warned drivers of the dangers of using the route in winter weather. The location of the Berwyns Detailed map of North Wales. Just after 8-30 p.m. (Some accounts say 8-38p.m.) the whole of the Berwyn Mountains region was subjected to a violent earth tremor, some likened it to an earthquake, which registered 4.5 on the Richter scale. This seismic shock was reportedly felt as far away as Wrexham, Chester, Liverpool, Southport, and even in some areas of Greater Manchester. Almost coincidental to the massive earth tremor the winter’s evening was rent asunder by what the local residents suspected to be the sound from one or possibly two enormous explosions. The local people of the area were amazed and shocked at the power of the events as furniture moved in their houses, buildings vibrated and on running out into the village streets, some eye witnesses reported seeing lights streaking across the sky. Looking up to the hill tops, many of the residents observed a mysterious glowing object accompanied by what some described as “fairy lights” in the sky. Fearing a disaster such as a plane crash, many of the residents contacted the police and emergency services. In fact, based on previous experience of such a crash, Pat Evans a nurse who lived locally contacted the police and volunteered to attend the scene. She was somewhat fearful but eager to help if possible. As she, along with her two young daughters, made her way up the narrow, isolated mountain road (in fact little more than a track) she was staggered to observe a large, glowing sphere which appeared to pulsate and simultaneously change colour from red to yellow to white. Above and below this object she also observed the accompanying small white lights. It was quite apparent to the nurse that the object was in a remote, inaccessible location and she decided to make her way back home. Pat Evans observed the attendance of the Police as she made her way back down the country roads. Pat Evans and her two daughters were interviewed in a television documentary “Down to Earth” (Discovery Channel 1996) and spoke quite clearly about the object they saw on the lonely hillside. Initially they thought that the small white lights were a rescue party but quickly realised that there had not been enough time for a rescue to be organised. Mrs. Evans and her daughters are quite categorical about what they saw that night, namely a large, glowing ball of light. There is also little doubt that they were quite aware that the attendant lights were those of a group of people crossing the mountain side. Pat Evans - district nurse who, fearing a plane crash, ventured up the mountain road to offer help. She didn't find a crash aircraft but observed a large, glowing sphere on the mountain side. Diane Evans - Pat's daughter. Along with her mother and sister, Diane is in no doubt that she saw a large ball of light. Pat's daughter Tina endorses the statements of her mother and sister. Pat and her daughters state quite categorically that they observed a large, glowing sphere of light. Note that they were quite aware that the attendant lights were caused by people and not meteorites. According to some reports, apparently within a very short period of time, especially allowing for the remote location involved, police and military personnel had arrived in force and it was designated a “no-go area”. Even farmers were restricted from accessing their land. Also, there was high presence of military aircraft in the skies over the Berwyn Mountains and along with university scientists, a number of strangers were seen combing the mountainsides and investigating the events. There were reports of military personnel removing large boxes which were transported away on army vehicles. The incident also attracted the immediate attention of not only the local press but also the national newspapers. The dramatic events on the remote Welsh hillside were given coverage on national television and radio for a number of days. The incident hit the news immediately. Perhaps the most obvious explanation of the evening’s events would be that of the crash of a aircraft, possibly a military plane. A top-secret experimental aircraft would probably fit the bill even better. Certainly initially the local police suspected such an explanation. However, any such event has been denied by the authorities and would it have fitted the evidence anyway? Could the authorities have hidden the fact that a military craft had hit a lonely mountainside with such immense effects, the attendant probable loss of life and the immediate damage to the local environment? Would a plane crash have caused the strange lights that were observed plus the appearance of a large glowing sphere? Perhaps as a comparison in 1973 there was a massive explosion at a chemical plant at Flixborough in North Lincolnshire. The blast from the explosion rattled windows covering a radius of approximately 20 miles. In order for this to happen the explosion was enormous causing devastation in the immediate locality of the chemical plant. The shock waves from the Berwyn Mountains incident were reportedly felt some 40 miles away from the suggested site of impact. For this to have happened the crashed aircraft would either have had to have been very large or its payload highly explosive. Whatever, the immediate area of destruction would have been colossal and the mopping-up procedure would not have taken days or weeks but possibly months. The forensic evidence after such a crash would probably still be evident after 30 years, especially to the trained eye but the initial damage to the environment would have been quite evident to anyone who ventured up that lonely hillside. To suggest that such an event could be “covered up” would rather be like intimating that the Lockerbie disaster could have been kept from the public eye – impossible. In his book “Cosmic Crashes” (Simon and Schuster, 1999), Nick Redfern dedicates a full chapter to the incident in the Berwyn Mountains – Mountains of Mystery (Chapter Seven) – in which he presents a case supporting the concept of a UFO crashing into the lonely Welsh hillside. Nick Redfern was the “major player” as far as the crashed UFO theory was concerned but by the time of the publication of Dr. David Clarke and Andy Roberts’ book “Out of the Shadows” (Piatkus, 2002), he had seemingly mellowed his opinion that a UFO had crash landed in the Berwyns on the evening of January 23rd, 1974. As with the theory that an aircraft crash has caused the incident, the suggestion that an extraterrestrial craft impacted and the incident was successfully covered-up by government agencies does not stand up to examination. Even with prior knowledge of such an event the logistical problems would be a nightmare. Certainly the craft mentioned by Nick Redfern in his book “Cosmic Crashes” could not have been removed by any number of military personnel in just a few days. To even consider the possibility of a craft of that size being dismantled and transported without the exercise being quite evident is beyond the limits of any reasonable imagination. This is apart from the fact that the object would have to have been constructed in such a way that it could be conveniently dismantled, completely ignoring any scientific procedures that would have to have been adhered in order to avoid cross-contamination etc….. The thought that a massive craft of extraterrestrial origin plus any possible inhabitants of the craft could have been reduced to suitable components for transportation in just a matter of days is, like the plane crash theory, untenable. Also, as with the plane crash theory, in order for the crash to create shockwaves that were felt up to 40 miles away, there must have been severe environmental devastation to the immediate locality, devastation on such a scale that it just couldn’t be hidden. Let’s remember that the Berwyn Mountains are inhabited by people who for generations have made a living from the land. Could the evidence of any form of high impact crash involving a craft of any origin be covered up to such an extent that it fooled the local population or, indeed, anyone with a spattering of observational capabilities. A UFO quite definitely did not crash into a Berwyn mountain top in North Wales on 23rd January, 1974. A Load of old Bolides? Dr. Ron Maddison, an astronomer, actually visited the Berwyns within a few days of the incident in order to conduct an investigation. Dr. Maddison came to the opinion that the events had been caused by the entry into the atmosphere of a number of bolide meteors accompanied by an earth tremor along the Bala Fault. Dr. Maddison was also interviewed for the television documentary “Down to Earth” and gave voice to his opinions therein. Dr. RonMaddison, respected astronomer, claims that the events were caused by the entry into the atmosphere of a number of bright meteorites and an earth tremor. Andy Roberts was employed as "series consultant" by the company that produced the documentary "Down to Earth" which featured Dr. Ron Maddison's explanation for the Berwyn Mountains Incident. Andy conducted an investigation some years later and came to the same conclusions as Dr. Maddison. Andy Roberts did investigate the Berwyn Mountain Incident in some depth (The Berwyn Mountain UFO Crash - A British Roswell?) and along with Dr. Clarke he also covered the incident in their book “Out of the Shadows”. In “Out of the Shadows” they endorse Dr. Ron Maddison’s explanation in maintaining that the events were caused by human misperception and the coincidental occurrence of a number of bolides entering the earth’s atmosphere at the same time as an earth tremor taking place. Roberts also maintains that a group of poachers were on the mountain side that night and their lights added to the confusion. Roberts and Clarke also maintain that the refusal of Ufologists to make use of all available sources of documentary evidence has encouraged the development of an alleged government cover up of an alien crash landing. Without doubt this last assertion is true but the question has to be asked – could the appearance of a large glowing sphere be attributed to a meteor shower? Is this explanation just a little bit too “coincidental”, does it really fit the bill? There has been talk of an “alternative explanation” for the Berwyn Mountains incident, an alternative that has not been discussed - is there evidence available that provides an alternative and plausible explanation of the Berwyn Mountains Incident? Evidence that meets the basic accepted facts of the sound of enormous explosions, a strange glowing sphere and the military presence on that desolate Welsh hillside on a cold winter’s night? Mrs Evans was able to describe the ball as ‘large’, and forming a ‘perfect circle’. But it didn’t appear to be three dimensional. In an interview she recalled, ‘There were no flames shooting or anything like that. It was very uniform, round in shape...it was a flat round...’. As she watched in puzzlement the light changed colour several times from red to yellow to white. Smaller lights, ‘fairy lights’ in Mrs Evans’ words, could be seen nearby. The above statements refer to the incident in the Berwyns but were the events witnessed by the residents of that lonely location in North Wales unique? Are there any other incidents that offer the same evidence as the Berwyn Mountain events? Let’s take a look at just a few reports of incidents which took place in other parts of the world and over a large time span. On June 17, 1966 from the air near Teheran, Iran, several airline pilots sighted a brilliant sphere of light, "sitting on the horizon," so to speak, deep within the Soviet Union. The intensely glowing sphere expanded to enormous size, dimming as it expanded, always remaining "sitting on the horizon." The pilots observed the phenomenon for 4 to 5 minutes. A CIA report on the incident was released under the Freedom of Information Act. On September 10, 1976, the crew and passengers of British European Airway Flight 831, over Lithuania en route from Moscow to London, observed an intensely glowing, stationary ball of light above the clouds underneath the plane. When alerted by the airline pilot, Soviet authorities on the ground curtly informed him to pay no attention and, effectively, to exit the area. On June 18, 1982, pilots and crews of Japan Air Lines Flights 403 and 421 reported sighting a giant, expanding globe of light in the North Pacific, 700 kilometers east of Kushiro. In the late 1990s John Locker (acknowledged satellite expert, astronomer, broadcaster and researcher) received a report from Jim Kopf which referred to an incident which occurred whilst he was serving on the aircraft carrier, USS John F. Kennedy CVA-67 (now CV-67) in the area of ocean which has become to be known as the Bermuda Triangle. The year was 1971 and the ship was returning to Norfolk, VA after completing a two week operational readiness exercise (ORE) in the Caribbean. Jim Kopf’ was assigned to the communications section of the ship and his report related an incident which occurred one evening at approximately 8-30p.m. “There is an intercom there to communicate with the Signal Bridge and over this intercom we heard someone yelling "There is something hovering over the ship!" A moment later we heard another voice yelling. "IT IS GOD! IT'S THE END OF THE WORLD!". We all looked at each other, there were six of us in the Comm Center, and someone said, "Lets go have a look!". The Comm Center is amidships, just under the flight deck, almost in the center of the ship. We went out the door, through Facilities Control and out that door, down the passageway (corridor) about 55 feet to the hatch that goes out to the catwalk on the edge of the flight deck (opposite from the "Island" or that part of the ship where the bridge is). If you have ever been to sea, there is a time called the time of no horizon. This happens in the morning and evening just as the sun comes up or goes down over the horizon. During this time you cannot tell where the sea and sky meet. This is the time of evening it was. As we looked up, we saw a large, glowing sphere. Well it seemed large, however, there was no point of reference. That is to say, if the sphere were low; say 100 feet above the ship, then it would have been about two to three hundred feet in diameter. If it were say 500 feet about the ship then it would have been larger. It made no sound that I could hear. The light coming from it wasn't too bright, about half of what the sun would be. It sort of pulsated a little and was yellow to orange……………………………………… I heard from the scuttlebut (slang - rumor mill) that three or four "men in trench coats" had landed, and were interviewing the personnel that had seen this phenomena. I was never interviewed, maybe because no one knew that I had seen it. A few days latter, as we were approaching Norfolk, the Commanding and Executive Officers came on the closed circuit TV system that we had. They did this regularly to address the crew and pass on information. During this particular session the Captain told us how well we did on the ORE and about our upcoming deployment to the Mediterranean. At the very end of his spiel, he said "I would like to remind the crew, that certain events that take place aboard a Naval Combatant Ship, are classified and are not to be discussed with anyone without a need to know". This was all the official word I ever received or heard of the incident. I found your message most interesting and thought provoking. I find your theory very believable and plausible. You may use my experience and use my name if you would like. I have received a few messages concerning my post and all have been very good responses. Years ago when I experienced this I didnt even think of aliens at the time but because we were in the Bermuda Triangle thought of it more as a strange phenomena. To tell the truth, a few days after the incident, I didnt even think of it again until years later. I guess I was thinking more about my impending marriage and my life in general and could not be bothered with trivial things like UFOs <grin>. Let me know how your investigation progresses. Have a very Merry Christmas and a great New Year. These are not UFO reports but were believed to be resultant of the deployment or testing of a military weapon. But is there such a military weapon or device which creates enough energy to cause a massive earth tremor and also a bright sphere which the uninformed could be duped or persuaded into believing to be a UFO? “It would be possible to split the planet, by combining vibrations with the correct resonance of the earth itself. Tesla stated, "Within a few weeks, I could set the earth's crust into such a state of vibrations that it would rise and fall hundreds of feet, throwing rivers out of their beds, wrecking buildings, and practically destroying civilization. The principle cannot fail..."
Tesla once set off a growing local vibration and shaking of the entire neighborhood around his laboratory, using a 10-lb. device. Tesla later improved on his concepts, calling this area "telegeodynamics". "The rhythmical vibrations pass through the earth with almost no loss of energy... It becomes possible to convey mechanical effects to the greatest terrestrial distances and produce all kinds of unique effects... The invention could be used with destructive effect in war..."
“The development of a new, fantastic weapon-one so powerful it could wipe out all life on earth if unrestrainedly used.” The New York Times printed part of the story. President Khrushchev making a point at the United Nations. It is thought that Khrushchev and Lysenko were referring to the newly emerging scalar EM weapons. So in early 1960s were the Soviets at least what we call the engineering development stage for large scalar EM beam weapons, which would be deployed when finished? The original concept of Scalar EM devices has been attributed by some to electrical engineer T.H. Moray of Salt Lake City. By 1939 Moray had developed a “radiant energy device” which weighed only 55 pounds and produced 50 kilowatts of power. It is thought that detailed drawings of this device were obtained by subterfuge by the Russians. In the years that followed World War Two a massive and aggressive arms race began between the U.S.A. and Russia. Russia fell somewhat behind as far as the development of rocketry and aircraft were concerned but were, presumably, ultimately successful in the development of Scalar EM weaponry. The reports relating to the sighting of bright spheres of light, above, have all been attributed to the development and testing of Scalar EM weapons. Saryshagan apparently contains at least one directed energy or particle beam installation which could possibly function as a scalar interferometer/scalar EM howitzer. Downie observed multiple incidents in the direction of Saryshagan during the actual month (September 1979) that the first anomalous flash was detected by U.S. Vela satellites. The peculiar "nuclear flashes" seen by the Vela satellites in September 1979 and December 1980 could have been due to a testing of a scalar EM howitzer in the pulsed exothermic mode. In the mode, scalar EM pulses meet at a distance, where their interference produces a sharp electromagnetic explosion (hence the "flash", very similar to the initial EMP flash of a nuclear explosion. Even in the vacuum of space, such an explosive eruption of energy from within the local spacetime vacuum itself may be expected to lift matter from the Dirac sea, producing a plasma. Prompt absorption and re-radiation of energy from this sudden plasma may be expected to present nearly the same "double peak" profile as does a nuclear explosion. This was the profile presented by the flashes. Note that the second flash detected was apparently of an "explosion" primarily in the infrared, almost certainly ruling out a conventional nuclear event. It does not rule out, however, pulsed distant holography using pumped EM giant time-reversed wave transmitters. In 1952 the CIA Walter B. Smith, Director of the CIA, wrote to The National Security Council suggesting the consideration that problems connected with unidentified flying objects appear to have implications for psychological warfare as well as for intelligence and operations. In other words, military activity such as the testing and development of aircraft, weaponry and equipment, could be hidden behind a “smoke screen” of deliberately fabricated UFO activity and reports. In his television documentary “Secret Evidence” (Channel 4 Television) Nick Cook (“Jane's Defense Weekly”) explored this concept of using UFO reports to mask military activity. in the years following the Second World War. Gildenberg confirmed that, at times, they actually used UFO reports generated by the sighting of top secret devices, in order to keep track of the devices themselves. He also gave credence to the suggestion that this usage of UFOs as a “cover-up” did, in fact, migrate across the Atlantic and was used to good effect in the U.K. The 1952 CIA memo which refers to the use of UFO reports to cover-up military activity. 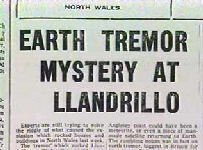 Is there enough evidence to propose that the incident which occurred in the Berwyn Mountains on January 23rd 1974 could have been caused by the testing of a military device which was covered up by the use of a UFO story, sensational enough to distort and pollute the true events so much that they are not even given proper consideration? Certainly it seems unlikely that the British Military were not in the development stage of EM weaponry in the 1950s but possibly the situation had changed by the 1960s and into the 1970s. As we have seen, events very similar to those which occurred during the Berwyn Mountains Incident have, in fact, happened previously. The appearance of a large sphere of light – again apparent in the use and testing of Scalar EM weapons. The seemingly immediate presence of the military – they were there before the test commenced. It should be noted that the more isolated and exposed areas of Wales have frequently been used by the military for training, testing etc… The presence of the military would also explain the attendant lights seen by Mrs Evans and her daughters and which Andy Roberts attributed to poachers’ lights. The removal of a large wooden box by the military – the transportation of the weapon itself. It worth considering that EM devices are reputedly quite portable – Tesla’s device weighing only 10lb and T.H. Moray’s only 55lb. It was known that a bolide meteor shower was due to enter the Earth’s atmosphere that evening and would be visible in the geographic location – an ideal cover up for any strange lights that would be seen in the skies over the Berwyns. The fact that the press and television latched on to the story in so much details so quickly – deliberately motivated by the military and other agencies using the old ploy of covering up a military operation by the use of a UFO sighting. As we have seen, Nick Cook’s research certainly supports this concept. It is of interest to note that the original calls by the residents of the Berwyns to the emergency services were because of their concern that there might have been a plane crash, something that had happened previously in the area. There seems to have been no intimation on the evening of the 23rd January 1974 that anyone reported a UFO incident. Whilst we can be absolutely certain that it wasn’t little green men from space who were running about a hillside in the Berwyn Mountains on January 23rd 1974, we can consider that it was, in fact, the British Military in combat fatigues, panicking because the testing of a Scalar EM weapon had gone astray. In 1980, an electronics engineer named Arthur Adams, who had worked on Concorde, visited the Berwyn UFO crash-site and found strange green coloured pieces of metal embedded in the rocks there. He took samples of the metal to his laboratory and discovered that a sample the size of a 1-inch cube gave off two kilowatts of electricity, when wired up to a volt meter. Mr Adams contacted the Daily Express, and they published a series of articles about the strange find, but the Ministry of Defence stepped in and killed the story. Perhaps the British Military did, in fact, leave evidence of the deployment of a Scalar EM device on that lonely Welsh hillside in January 1974. On Wednesday 14th June 2006, BBC 2’s nightly news programme “Newsnight” featured an item on “Black Projects”, discussing the incidences of top secret military weapons etc.. being tested in UK airspace. During the programme Jeremy Paxman, anchor man of the show, stated that during the 1980s and 90s there were numerous sonic booms heard down the west coast of the U.K. which remain unexplained. Some of these “booms” were so powerful that they registered as earthquakes.